Orchard Fresh Nutrition : Get some Pork on your Fork! Many of my clients will say to me things like "I sometimes have pork, which I know is bad." To this I exclaim, "Absolutely not! Pork is wonderful!" Sure, devouring roast pork and crackling or a big pork chop with a thick rim of fat is certainly not something I recommend (whopping saturated fat dose there), but a lean piece of pork is a nutritional goldmine. Did you know, lean pork (meaning pork without fat) is an excellent source of protein which will keep you full, strong and healthy. It is also rich in thiamine, riboflavin, niacin and vitamins B6 and B12, which support metabolism, mental function, energy, growth and prevent anaemia. Pork also provides selenium, zinc, and omega 3 for healthy eyes, brain, skin and reduced risk of illness. To top it all off, lean pork has less than half the fat of beef fillets, less fat than snapper or chicken and is a source of iron. Pork is very versatile and offers increased variety to your diet, so why not get some pork on your fork?!? Pork features regularly in my household, as we are able to buy it in bulk from our local butcher, making it an economic option. We typically buy a few lean pork fillets at once, add our homemade marinade of choice and leave them to marinate overnight. The next day we will cook one fillet and freeze the remaining fillets (uncooked) so we an whip them out and cook up a delicious dinner in next to no time during busy weeks. Preparation and planning is crucial to keep a healthy diet on track. 1. In a bowl or baking dish, add crushed garlic, grated ginger, five spice powder, cornflour, boiling water and soy sauce and stir to combine. 2. Add pork fillet and cover well with marinade. 3. Cover dish with cling wrap and leave in the fridge overnight to allow flavours to permeate the pork. 4. To cook the pork, I recommend barbequing over the grill on the barbeque, basting with residual marinade from the dish, for about 30 minutes or until pork is just cooked through. 5. Remove from grill, slice pork and serve. This dish pairs well with stewed apple and vegetables or alternatively with stir fried Asian greens and slivered almonds. Enjoy! 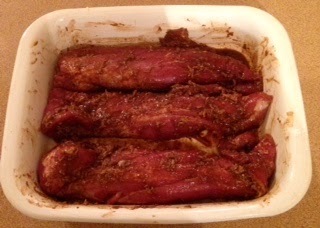 Marinating 3 pork fillets, one to eat the next day (after marinating overnight) and the other 2 for the freezer. 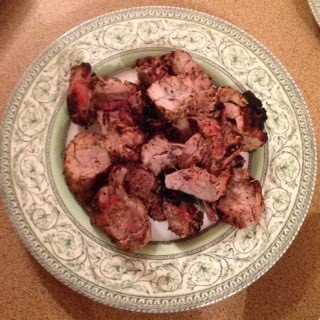 Sliced Fived Spiced Pork straight from the BBQ, ready to be enjoyed! 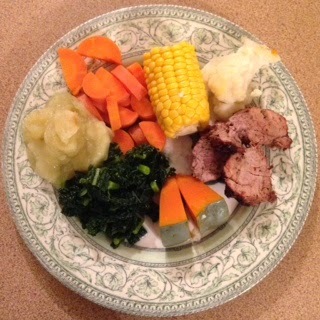 Five Spiced Pork, stewed apple, Tuscan cabbage and steamed carrot, pumpkin, cauliflower and corn for a wholesome, satisfying and delicious weeknight dinner. So, dear readers, fear not pork! Add some variety to your weekly repertoire and get some pork on your fork!! For more tasty pork recipes, check out the Australian Pork Recipe Finder .